One of my goals for my "30 Before 30" project was to make a quilt. My sister-in-law, Sarah, is the most amazing quilter (but she's so modest and will say something like "oh, I am not!" when she reads this). She has gifted both my boys with beautiful quilts (one for Will, one for Fritz). Now that I'm having a girl, I was finally motivated to try to make one myself... it is no joke (and neither is taking a picture of it)! I spent hours and hours working on this thing and when it was done, I kind of went... "meh". Now that it's washed, I like it a little better but some of the stitches aren't perfect and it turned out nothing like I imagined. Other than the annoying mistakes I made, I'm glad to have completed a goal! I didn't give up halfway! This is progress, people! It's also nice to have made something special for my baby girl, especially since I've been having a hard time not being able to decorate a nursery for her before she comes. Only about two more months and I get to meet her. This thrills me to no end! Also, here's a 30 week belly shot for our family journal. 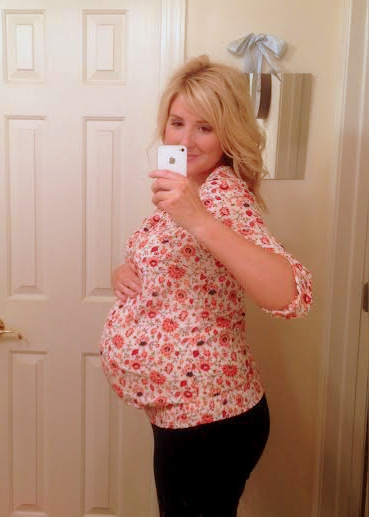 I'm so pleased with myself for documenting this pregnancy (I think I have two total from William's pregnancy - so yay!). So beautiful, Lizzy! I've never had the skill or patience (or time) for projects like that. Beautiful job on the quilt..If it were perfect it would not be homemade...all those booboos are just love poured into it. Liz, You did an amazing job of taking on such a huge project. The quilt is beautiful, and your little girl will treasure it! Oh! I can't wait to see pictures of her in a few months!!! What a cute quilt! Only you will fret about the flaws. Your daughter will love it. I've always wanted to get into quilting. Do you have a special sewing machine for it, or did you use a regular one? I've always wanted to get into quilting. Did you use a special sewing machine for it, or can you use a regular one? It was surprisingly easy - it just took a lot of time and patience. I'm sure you could do it, as long as you know basic sewing skills. I just used a regular sewing machine (my mom's ancient - but awesome - Bernina). It's so beautiful! I am excited to see it, and your baby girl, Jemima. She is going to love cuddling in it! I'll give you $5 if you name her Jemima. So beautiful! I love the soft colors-- perfect for a baby! I wouldn't even know where to start with a quilt. Literally. Do you buy the fabric first?